Dad (Hubert Lester Jay) played rugby for Fielding and Platt. I know he loved his rugby and I think later on he played for Rotol. 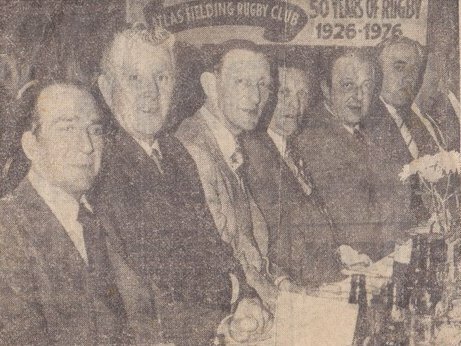 He is pictured on the left of the photograph at a celebration of 50 years of Atlas Rugby in 1976. He served his time as an apprentice at Fielding and Platt. I have his Apprenticeship Indenture dated 1927 when Dad was 15 years old agreeing to a six year apprenticeship as a Machinist. His first-year wage was 9s[hillings] 0d [pence] for a 47 hour week. It was signed by Frank T. Morris and then, on completion of the apprenticeship, by A. J. Fielding – Director. I too worked at Fielding and Platt’s for two years 1960-1 as a shorthand typist in Bill Reading and Harry Price’s office along with Grace Dix and Sylvia Baker (nee Proctor). My cousin Jim Rigby was also an apprentice with Fielding & Platt – moving on to other companies after he finished his apprenticeship and has now been living in America for a number of years. Looking back I realize that Fielding & Platt featured substantially in the lives of my family. I see my brother (Alan Stuart Jay) is adding his memories to the website. I do remember his time in France especially when he came home he would bring me perfume and also a bracelet which I still have (lovely brother).